Bus from Melaka to Singapore is one of the hottest routes, especially on Sundays. If one is travelling on Sunday by bus from Melaka to Singapore, online booking in advance is a must or one risks not getting any ticket. Melaka (Malacca) is as a UNESCO world heritage site since July 2008. Visitors going to Melaka to view the historical-rich city have increased massively. Besides the attractions, some people come to Melaka (Malacca) for its famous food like chicken rice ball, satay celup, chendol etc. After spending the holiday in Melaka (Malacca), tourists will go to next stop in Singapore and Singaporeans will go back to Singapore by taking bus from Melaka to Singapore. Delima Express, KKKL Express, 707 and Starmart are the all-time favourite choices of bus operators serving bus from Melaka to Singapore. Most coaches depart from Melaka Sentral Bus Terminal and go to Singapore directly with just 1 washroom break at highway resting area. The journey usually takes about 4 hours depending on traffic condition. Their arrival points in Singapore are at City Plaza (Payar Lebar MRT) and Woodlands Checkpoint for Delima Express, Bugis MRT Exit D, Tampines and Kovan Hub for KKKL Express, Golden Mile Complex for Starmart and Boon Lay, Queen Street, Ban San Street and Woodland for 707. Besides the above-mentioned bus operators, other bus operators like WTS, The One Travel, Grassland Express, Luxury Coach and Transtar also provide buses for this route. They provide bus from Melaka to Singapore with departure points at various hotel main entrances. These hotels which are located in Melaka city centre are within walking distance from major attractions, but is 15 minutes driving distance away from Melaka Sentral Bus terminal. Hence with this better service is provided, passengers save the hassle from travelling from hotel to Melaka Sentral for boarding. Their arrival points in Singapore are at Singapore Flyer for WTS, Golden Mile Complex for The One Travel and Transtar, and Orchard Road for Luxury Coach. The bus fare for coaches departing from Melaka Sentral is cheaper at around SGD 13 or RM 25-26, depending on coach operator selection. As for bus services departing from hotels, the bus fare is higher at around SGD 18-33. 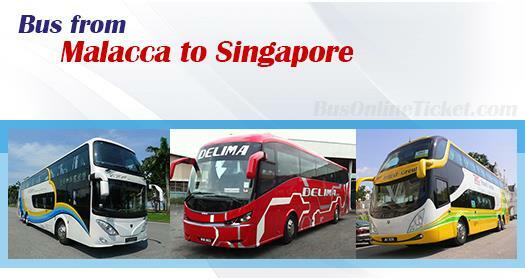 Because of the highly sought-after tickets of bus from Melaka to Singapore, travellers should always book Melaka to Singapore bus ticket online in advance in BusOnlineTicket.com to avoid being stranded in Melaka without a ticket to Singapore. Booking Melaka to Singapore bus ticket in BusOnlineTicket.com is instant confirmation after online payment. Thus, this makes BusOnlineTicket.com one of the most credible and reputable online booking portal among its customers throughout these years.